I recently finished reading the famed Harry Potter series. Some will gasp or double-take. Others might have a sore opinion of me, finding that I succumbed to reading the “heathen” books. ((I jokingly referenced them as the “heathen” books while reading the series)). In fact, some friends who have compared my reading the books to the day pigs fly, won’t believe that I’ve read them. Oh well. Those who believe me, read on. My decision to read the series came from a purely academic standpoint. As an aspiring author, people informed me that reading J.K. Rowling’s series was a must. By reading the famed series, I would be able to grasp what I’m going up against – supposedly scoping the competition (I guess). I mulled over the decision for about a year. Then, a trustworthy person confided in me that she believed I was now old enough to read the series. Having a firm faith base, I could accept the fact that Harry Potter is purely fictional. For many reasons, both stated and not, I decided to embark on the Hogwarts journey, and I do not regret this decision. J.K. Rowling is a fantastic writer. She is an artist in the way she weaves the story of Harry Potter’s life. She leaves minuscule bits of information in each book, little clues in which she builds the foundation for later events. The characters actually grow! The characters are like living breathing organisms that learn from mistakes, build on previous knowledge and develop both emotionally and physically into relatable characters. Also important to realize, is that these characters are not relatable due to blandness but due to realness. Unlike Twilight’s popular Bella character who is so plain and bland that any girl could visualize themselves as her, these characters jump off the page and show us copious facets of their intriguing personalities. With each page I felt Rowling mentoring me in how to approach the art of writing. Fantastic stories. Relatable characters. Absolutely brilliant writing! I respect my parent’s decision in barring me from books when I was younger. Mom and Dad, if you read this understand that I know you made the right decision and my act of reading the books now was not out of rebellion but through a long, well-thought out process. One of the main benefits of reading the series as an adult derived from the ability to appreciate the books as pieces of literature. I appreciated their literary value. I don’t agree with everything I read in a literary works. Some characters express beliefs different from mine. That’s okay. As an actor, you learn to put on characters that don’t necessarily believe what you believe or act like you act. However, you take something of yourself and plug it into that character. Aspects of your experience allow the character to become more real to the audience. The same concept holds true for literature. An author creates characters that relate to the “real world.” The reader can pull aspects from the characters that relate to experiences in their own life or aspects of their own personality. I’ve heard speculation where people have compared Harry Potter characters to characters in the Bible. To me that is HUGE stretch. If you’re looking hard enough for Christian allegory, you’ll probably find it in any story you dissect. 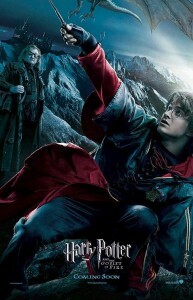 However, I felt touched in what I took away as the main idea or theme of Harry Potter. Every person has a capacity for evil, but it is the choice not to act on that capacity which defines us. Love, friendship, family — these have the power to overcome evil. Jesus’ sacrifice on the cross, notably the BIGGEST act of love, overcame death’s hold on humanity. This is what I took away from Harry Potter. Love, not in the worldly sense of the world, can overcome evil. A good message, mind you. If I allow my kids to read The Harry Potter Series, I will definitely control the rate at which the books are read. The second half of the series tackles darker subjects, darker struggles, which need to be read by someone who is more mature in their faith. I don’t believe that the series is evil. I thoroughly enjoyed reading the books and felt no pressing on my spirit to stop reading at any time. However, with most things in life, different maturity levels are required to tackle different subject areas. You wouldn’t hand a copy of “Atlas Shrugged” to a third graders and say “Hey, tackled this.” Common sense needs to be used. J.K. Rowling is a fantastic writer and has landed on my list of top authors. She did an excellent job with this series and I’m excited to see what else she has up her sleeves. Well done, Rowling, well done. I completely agree! My parents also barred me from reading the series. What piqued my interest was finding out that Rowling is a Christian, and hearing many positive reviews from my proffs at a Christian college. I did see some Christian themes (some more blatant than others) but there were things I found slightly contradictory to what I believe as well. Rowling is only human after all. If I ever have kids, I might have them wait until they’re in their teens, depending on how I gague their maturity and what tempts them most. For instance, if they’re tempted to practice witchcraft, Harry Potter might not be the best choice for them until God helps them past that. I respect my parent’s decision too, even though I’m still not sure I grasp the reasoning behind it. I pretty much waited until I moved out, so it wasn’t really rebelling from my perspective. Next Next post: A Penny for my Thoughts.